There are eight species of Sarracenia, The North American Pitcher Plants. These prehistoric looking plants are characterized by leaves that curve into tubular funnels which catch and digest insects. Pitcher Plants range in height from 4" long (Parrot Pitcher Plant) to more than 3' tall (Yellow Pitcher Plant). 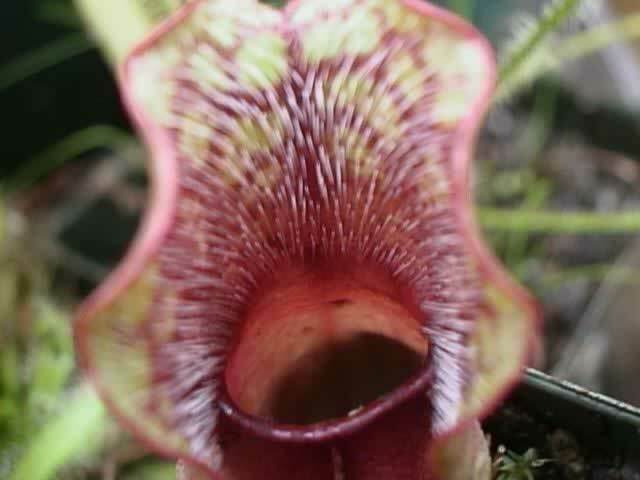 Pitcher plants attract their prey with an intoxicating nectar which is secreted from the hood of the funnel. Once the insects enter the pitcher, escape is nearly impossible because of the downward pointing hairs on the inside of the hood and the slippery wax coating on the inside of the Pitcher's tube (not to mention the fact that they may be a bit drunk). The unfortunate insect meets it's doom when it falls into the pool of liquid in the base of the funnel, and is digested by the enzymes which the plant excretes. The beautiful coloring of the North American Pitcher Plant will be much more intense if the plant receives at least a couple hours of bright, full sunlight each day, but will also grow reasonably well in partial shade. A temperature range of 60 to 85 degrees F. is ideal. Pitcher Plants should be grown in a mixture of live Sphagnum moss, medium orchid bark and charcoal. If you are unable to get any living Sphagnum moss, a mixture of peat moss and coarse builders sand will suffice. Make sure the soil is kept very wet during the growing season, from May through October. Pitcher Plants require a dormant cycle in the Winter. When active growth stops in late fall, clip off all of the dead or dying pitchers, leaving the smaller (still developing) pitchers. Keep them in an area that stays about 40 - 45 degrees for about 3 months, until new growth begins in the Spring. Pitcher Plants can be divided and repotted as the plant is coming out of dormancy, but this must be done before vigorous new growth begins. Most Pitcher Plant species are hardy in USDA zones 6-8, and may survive in even colder areas provided they are given a thick cover of winter mulch. They make excellent and interesting additions to any bog garden.